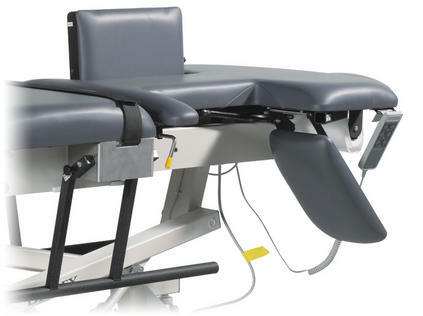 Accommodates ultrasound and echocardiography procedures. The Sound Pro™ Combination Table brings together the imaging features of both the Ultra Pro and Echo Pro tables. Fully equipped for OB/GYN, general ultrasound and echocardiography procedures, the extra wide tabletop is designed with advanced ergonomics to provide maximum comfort for both patient and sonographer. Designed to conform to natural body extension and sitting position, the motorized Fowler positioning is infinitely adjustable to 80 degrees via hand or foot control. The table is so accommodating, it reduces the total amount of time required to achieve a quality image. Stress patients are off the treadmill and quickly onto the table in imaging position. The cardiac drop-down cushion releases from either side of the table, providing open access to the patient’s left thorax area for an unencumbered apical approach. 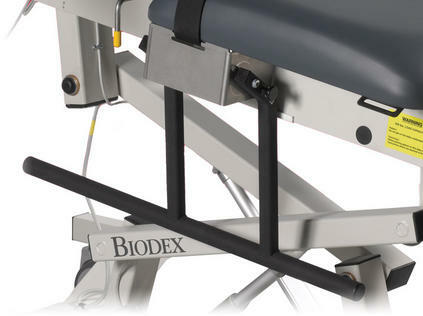 Flush-mounted side rails enable closer access to the patient, without sonographer contortion. When not in use, rails fold beneath the table, eliminating obstruction. Patient comfort is assured even during lengthy procedures with our Naugahyde® antimicrobial mattress cover, which also provides protection against bacteria. Standard accessories available to expand the function of your table include ergonomic stirrups that cup at the heel, an articulating scanning arm board (adjustable from 0 to 130 degrees) and a foot controller for when hands are busy with other functions. The optional Headrest is removable and adjustable, providing convenient access and patient comfort during carotid and thyroid procedures. Drop-down cushion releases from either side of the table. 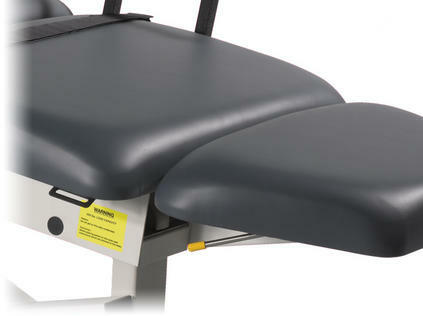 cushion drops down or folds up for maximum access to the patient.